Creative Assembly successfully builds on its adaptation of Games Workshop's fantasy universe. 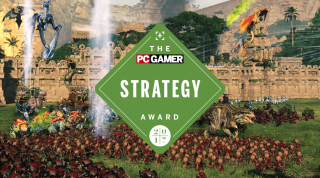 PC Gamer's Best Strategy Game of 2017 is Total War: Warhammer 2, as chosen by our global editorial team. Check out our GOTY hub for the rest of the awards and staff personal picks. Jody Macgregor: When I reviewed the first one someone said, "How come you only gave it 86?" (As if 86 isn't a high score.) I wish I could have seen the future and said, "Because the next one's going to be even better." Warhammer 2 learned from its predecessor's DLC—the Wood Elves and Brettonians each have their own endgame, whether about protecting a big tree or going on a crusade, instead of having to spread their paint to the map corners to win. The race to control the vortex feels similar but shared, so factions that are oceans away interact rather than waiting to be conquered. Plus adding dinosaurs to a game is worth an automatic extra six points. I don't make the rules. Steven Messner: Warhammer 2 sorts out one of the biggest problems in the original, in that its campaign was a real slog near the tail end. By comparison, the struggle to control the Vortex is thrilling in its final moments, as each faction races to complete the final rituals and enter a climatic final battle. And I have to agree with Jody, the Lizardmen are the single greatest addition. I know the crowd favorite is likely the Skaven, what with their armies of chittering rat-men, but I much prefer the ancient brutality and cold-blooded murder they provide. Warhammer 2 is gorgeous and one of the rare grand strategy games that excites just as effectively as it challenges. Nasty surprises are a Skaven specialty, and that makes them the most fun strategy faction of the year. Tom Senior: I agree, the new campaign structure is a massive success. The race to the vortex gives you a reason to keep plotting even if you enter the final phase of a campaign in second or third place. I find Total War: Warhammer 2’s campaign map to be more interesting, too. Rather than lumping everyone onto a single continent, you’re free to spar with opponents in your region before crossing the sea to make a big attack on a second front. It looks great too. The factions are great, and they are so varied that this feels like four Total War games in one. With fewer playable factions than traditional historical Total War, Creative Assembly has taken the opportunity to refine their personalities and playstyles with an expert eye for Warhammer Fantasy lore. Lizardmen were my first campaign, and I love their colourful units and magic rituals that summon armies of feral dinosaurs. The High Elves have great archers, shiny and a beautiful range of differently-flavoured dragons, and the prettiest homeland of any Total War faction. The Dark Elves have the Black Arks that let you raid the world from the oceans. I am team Skaven though. When you spread Skaven corruption in a province you can summon squads of rat men from underground. This is a nasty surprise for High Elf missile units that just love to stand on a hill and rain death onto your armies with master-crafted arrows. Nasty surprises are a Skaven specialty, and that makes them the most fun strategy faction of the year. Want more Total War: Warhammer 2 words? Check out our review.